Trainer Floyd Mayweather Sr. doesn’t want to see his son superstar Floyd Mayweather Jr. (48-0, 26 KOs) fight IBO/WBA middleweight champion Gennady Golovkin (33-0, 30 KOs) because he thinks he’d beat him and possibly knock him out in the process if he hit the Kazakhstan star just right. Floyd Sr. thinks Golovkin needs to chill out and forget about wanting to fight his son Mayweather Jr. because it’s a fight he would probably lose. I don’t think Golovkin is going to back off with his interest in fighting Mayweather Jr. just because Floyd Sr. doesn’t want to see the fight happen. Golovkin says it’s been his dream to fight Mayweather Jr. for a long time, and he’d come down all the way to 154 to make the fight happen if he could get it. Mayweather has already said that he’d beat Golovkin if they ever were to fight. 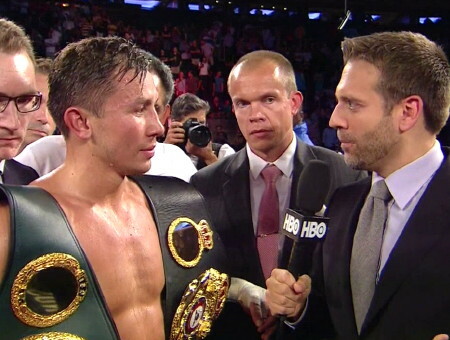 Mayweather says Golovkin’s style of fighting is simple without any bells or whistles. Since Mayweather has already said that his fight against Andre Berto on September 12th will be the last one of his career, I don’t think a fight between Mayweather and Golovkin is possible. It’s too bad though because it would be interesting to see Golovkin test Floyd Sr’s theory of Mayweather putting a whooping on Golovkin. For Mayweather to score a knockout of Golovkin, he’d have to hit him just right with a solid shot. The fact that Mayweather couldn’t KO Marcos Maidana, Saul “Canelo” Alvarez, Miguel Cotto, Robert Guerrero and Manny Pacquiao would kind of suggest that Mayweather lacks the pop in his shots to get a guy like Golovkin out of there, even if he lands the perfect punch. I don’t know if there is a perfect shot that Mayweather can land that would do the job on a guy like Golovkin. I think he would walk through every kind of punch that Golovkin would throw to get him out of there. If Mayweather wanted to really create an impressive legacy that rivaled the guys that he compares himself to like Sugar Ray Robinson, then it would be in Mayweather’s best interest to take the fight with Golovkin to try and prove himself against the fighter that many boxing fans see as the best fighter in the middleweight division. If Mayweather could beat Golovkin, it would be a pretty special win, and I believe the win would be even more impressive than Mayweather’s wins over Pacquiao, Canelo and Cotto. Golovkin is a middleweight, and slightly lighter than the 175lb Canelo. Golovkin fights at 170 compared to Canelo’s 175. There’s no question that a victory for Mayweather over Golovkin would be a huge plus to Mayweather’s legacy. It would be the victory that would cement Mayweather’s legacy. No one would ask Mayweather to bother fighting guys like Amir Khan, Kell Brook, Keith Thurman, Shawn Porter or Danny Garcia if he could beat a fighter as good as Golovkin because it would be such a huge win for Mayweather. There wouldn’t be any other reason for fans to pressure Mayweather to fight anyone else because a victory over Golovkin would be the crowning achievement to Mayweather’s long 19-year pro career. One gets the sense that Floyd Sr. isn’t exactly excited about seeing his son Mayweather Jr. face the hard hitting Golovkin. You can’t blame Floyd Sr. for not being excited about the Mayweather vs. Golovkin fight taking place, because if Golovkin landed just right with one of his big left hooks or right hands, he might knock Mayweather clean out. Mayweather was hurt by Marcos Maidana in their second fight, and by Shane Mosley. If those guys were able to hurt Mayweather and put him in trouble then a fighter like Golovkin would have a good chance of doing even more. Canelo would have had a better chance of hurting Mayweather if he’d focused on slugging with him instead of boxing him like we saw in that fight. Canelo wasted his opportunity against Mayweather by fighting the wrong fight and basically giving Mayweather the win.